If you’ve experienced odor in your HVAC system you know how uncomfortable that can be. We’ve got some simple tips to eliminate odor in your HVAC system once and for all. Not only can odor in your HVAC system be obnoxious to your sense of smell, but it can also be unhealthy. 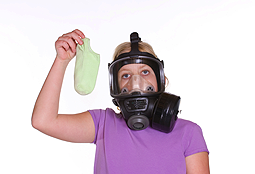 It is a warning sign to you that your indoor air quality is not what it could be. Follow these simple steps to eliminate odor in your HVAC system. The primary cause of odor in your HVAC system is mildew. It grows in a thin layer over many kinds of surfaces, and is caused by excess moisture. Your HVAC system is a prime spot for mildew and mold to grow, propagate and set up large colonies. The good news is there is an easy way to control the growth of mold and mildew in your HVAC system and by doing so, eliminate the odor! Here are some simple steps. But, before you start, make sure you have turned off you HVAC system at the source, your electrical panel. In addition, make sure you wear proper eye protection and breathing protection. Clean coils and treat with fungistat – Your air handler coils of arguable the most important part of your system. They are what cools your air. Coils that have been left unclean will cause excess moisture and will be a major cause of odor in your hvac system. make sure that your coils are cleaned at least once a year (or more). Once they have been cleaned, use a Fungistat like Mold Control to keep mold and mildew from growing on coils. This will eliminate the source of odors on coils and increase the efficiency of the system. double win! Check condensate pumps and treat pans with biocide and fungistat – While you are cleaning coils, check the condensate pan and pumps for proper operation. Stagnant water in the condensate pan is a major cause of bacterial growth and cleaning it will help eliminate odor in your HVAC system. Plus it can save you from a catastrophic failure in the future. If you have a condensate pump, make sure that it is functioning correctly sand have it replaced if not. Treat the area (pan and pump and drain) with a fungistat to reduce further growth of mold or mildew. Clean growth in duct work and treat with fungistat – check the first few feet of duct work from your air handle, Clean it with an EPA registered disinfectant like MMR-II and then apply Mold Control fungistat to prevent future growth. Check returns and clear of debris – Returns are areas where air is drawn into the HVAC system from inside your house. Check these returns for signs of mold growth. If you see them, make sure that you have the system checked as this may be a sign that there is too much humidity in the system and you have leaks or are not balanced on your system. Also, apply an EPA registered disinfectant to clean the area and then apply Mold Control fungistat to prevent future growth. Treat with an odor eliminator – Lastly, spray FreshDuct odor eliminator everywhere we just mentioned. On coils, on pans, in duct work and in air returns. This powerful odor eliminator will encapsulate any remaining odor molecules and eradicate them. If you follow these steps as part of a regular maintenance program, a smelly HVAC system will be a thing of the past. Make sure you use EPA registered products in you HVAC system that are properly labelled for use in HVAC systems. Doing this will help eliminate any issues you may have with using the wrong products that could be dangerous to your HVAC system and your health.